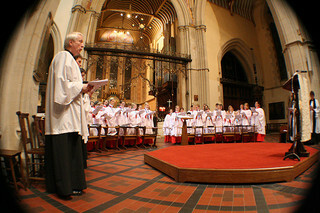 Carol Service by Stewart Macfarlane on Flickr. Some rights reserved. Here is the address I gave at yesterday’s carol service. There are two groups of people I would like us to think about for a few minutes this evening. Group number one: cast your mind back to July this year, and the birth of the royal baby. Crowds gathering at Buckingham Palace awaiting the posting of the official announcement; other crowds at St Mary’s Hospital, camera phones poised behind the barricades for that first glimpse, and then an outburst of applause and flash as the proud parents came out. Follow that with the speculation as we awaited the announcement of his name. And sure enough, he was given conventional royal names: George Alexander Louis. Kevin and Tyler weren’t in the running. Then we had the christening, where there was more media coverage about the gown the young prince would wear than the meaning of the ceremony. Do only the royals dress up their little boys in frilly clothes, or is it just preparation for a public school uniform when he is older? Trappings, ceremony, accoutrements – and enough coverage in Hello magazine to destroy all the rain forests. We expect that with a royal birth. Facebook and Twitter going crazy, you know the deal. Yet we celebrate a royal birth at Christmas that looks so different. No privilege, no wealth, no ease. Mary is a teenage girl who may popularly be suspected of a scandal. She doesn’t come from an upwardly mobile family, and she had no chance of an education, let alone one at a prestigious historic university. Joseph wasn’t born licking a silver spoon, and he merely grew up to become an artisan, working as some kind of carpenter, builder or stonemason. You want that extension on your house or that new fitted kitchen? Call Joseph, and he’ll turn up in his old Transit van, with his plaid shirt, beer belly, and a copy of the Daily Mirror. Royalty? Well, the only connection they got with royal circles was when the local despot Herod felt threatened and sent his death squads into Bethlehem. Mary, Joseph and the young Jesus have to leave everything behind and become refugees. No palace for them. All of which leads me to believe that the Christmas story is especially for the poor, the forgotten, the obscure and those who think they are nothing or worthless. Do you feel insignificant? Jesus came for you. Do you feel like you don’t count? Jesus came for you, too. Or do you feel like you are on the margins, or rejected, or that you will never be popular? Do you believe that you are the sort of person who, when fame and fortune come along the road, take a detour to avoid you? The Jesus who came in the Christmas story is for you. Perhaps, though, you are not like that. You may be one of those Surrey residents who has wealth or power or position or influence. If so, then the story of Christ’s coming at Christmas is one that holds dangers for you – or at least warnings. It is no good relying on our social position or our prestige with Jesus. Why would the King of Kings and Lord of Lords be impressed by that? Doesn’t your power or property seem puny in the light of who Jesus is? Christmas – the time when we celebrate the coming of the humble king – is the time when we can only come to that king in humility ourselves. We don’t get into heaven on the basis of our contacts or whose number is on speed dial in our phone. But if we do come in humility, then we discover the amazing truth that Jesus is for us. Group number two: they were a gang of heavy drinkers who lived on the outskirts of town. They carried weapons, which they were ready to use and they were known to conduct burglary raids together. Better not get in their way, or they might use a knife. They weren’t unemployed, they had a trade, but people were happy to do business with them, just so long as they stayed out of harm’s way. Although they tended to use other people’s land for their work, and if they came over your boundary, then you’d better not argue. At least, not if you wanted to keep good health. If you had a gang like that living in your town, what would your attitude be? Would you call the police? Would you band together to hold a public meeting and demand that civic officials took action? Would you lobby your councillors or MP? And what would you call for? ASBOs? Have them locked up? Perhaps they’re really illegal immigrants and should be deported. Do you know what you’ve just done? You’ve just kicked the shepherds out of the Christmas story. The shepherds were the rogues, the chavs, the petty criminals of first century Palestine. Not respectable. The Daily Mail would have run front page campaigns against them and their type. And yet, and yet … these people, these crooks, these bandits, these ne’er-do’wells, these scum of the earth are the first to hear the announcement that the Messiah has been born. If you think that Jesus came just to hang out with the ‘good’ people, forget it. He came for the bad and for the misfits. If you doubt me, think about some of the crowd Jesus hob-nobbed with during his adult life. They weren’t all scallywags, but plenty of them were. Simon the Zealot was a terrorist or a freedom fighter, depending on your political views. The brothers James and John had a nickname – they were called ‘the Sons of Thunder – well, what kind of guys get that for a nickname? Early Hell’s Angels, perhaps? Matthew was a collaborator with the occupying Roman army. So Christmas is a time to put to bed once and for all the idea that Jesus came for good people. Right from his birth, throughout his life even to his death on the Cross , when he was crucified with two common criminals, Jesus came to offer forgiveness and a new life to people who knew they were bad. If you think you are a failure, this is good news for you. if you think you could never possibly be accepted, this is good news for you, too. Jesus wants you to say ‘yes’ to him and follow him. But others here might be thinking, I don’t see myself like that. I’m a good, decent, hard-working member of society who is trying to be respectable. I put things into society, I’m not a taker. Why should Jesus favour the scroungers and the hoodlums? It’s unfair. Do you know what the basic problem with that argument is? When we try to argue that we are fundamentally good, we manipulate our image. Like a photo of a plump person with acne being made to look clear-skinned and slim in Photoshop, so we tell the good story about ourselves and we mask the ugly truth about our own selfishness. And Jesus won’t let us get away with that. Following him can only begin and continue with an acknowledgement of our selfishness, our thoughtlessness, our unjust behaviour. Without that humility he can’t clean us up, much as he wants to. So I invite you to be like the shepherds this Christmas. Come dirty to the manger, and find the One who accepts your praise, makes you new, and calls you to follow him. Posted on December 23, 2013, in Sermons and tagged Blessed Virgin Mary, carol service, Joseph, shepherds. Bookmark the permalink. Leave a comment.